Derek Braye Boss known by his stage name Derek aka ‘De Wonder Kid’ is a Nigerian Singer/Rapper, Songwriter, and instrumentalist from Sagbama L.G.A of Bayelsa State. Derek is the second child of Mr & Mrs Braye Boss a family from Bayelsa State, South South, Nigeria. 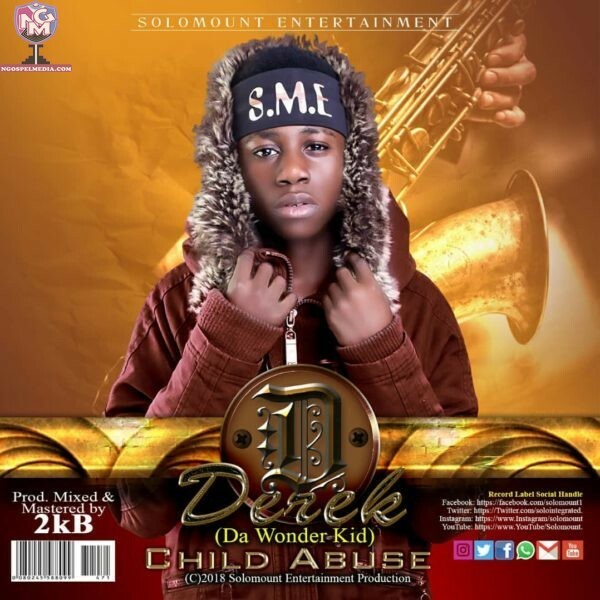 Born in 2005, Little Derek is a Hot Hip Hop Sensation who is currently singed to Solomount Entertainment. His 1st hit to limelight in November 2017 was at the AY Live Port Harcourt where He Performed and thrilled his audience with His Lyrical Prowess. Later that same Year, Naija FM Comedy and Jam night which played host to the ‘Creme de la creme’ of the Entertainment industry were thrilled to an outstanding performance of the young Lad. In this Classic Piece titled CHILD ABUSE, Derek cries out for Justice for the Abused Child in Nigeria, Africa and the rest of the World. There have been over 200 victims of Child Abuse Cases in Nigeria and no one seem to be taking serious measures and actions against the perpetrators of the Act. From physical abuse, to emotional abuse, mental abuse, sexual abuse, child trafficking, child labour. Derek uses this Piece to speak out, stop the abuse today, let’s give our leaders of tomorrow a reason to smile again because like these kids we were once like them.